Small Unmanned Aerial Systems (sUAS or Drones) are a staple in the toolkit of any videographer, and with good reason; they are used not only to create beautiful video from new (and previously unachievable angles), but to collect data that can be used for other production content. Cost effective, reduced risk, and often able to access in places that are generally inaccessible, this is not surprising that video professionals are rapidly adding sUAS to their production kit. 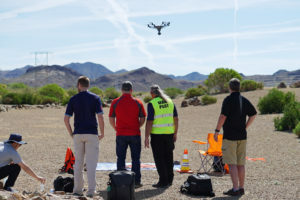 This field trip is designed for those either evaluating sUAS or who have recently acquired an sUAS for production use. Attendees will be able to fly with top instructors who are there not just to share best practices, they’re ready to address any questions or concerns ranging from standard practices, maintenance, or regulatory changes. This is a hands-on training course. Each instructor will have small groups of student pilots so that we can fit the training to suit your needs and answer your individual questions. An average of 3 staff members per every 10 students assures that you will leave with the information and the practice that you need to improve your UAV skills. Registration includes: round-trip transportation from Las Vegas Convention Center (LVCC) to flight location, catered lunch, drinks, snacks and all the hands-on instruction.